Air Force Common Admission Test (AFCAT) exam notice has published for the Male and Female from Indian Citizens. 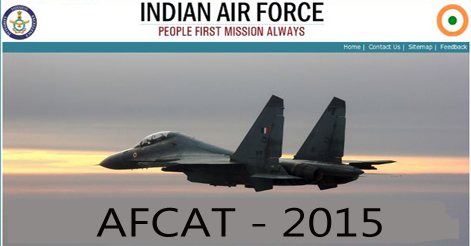 In Current Indian air force AFCAT 2015 for commissioned officers in flying, technical and ground duty branches and Permanent / Short Service Commission in Technical and Ground Duty Branches. The registration for online application has opened on 27.06.2015 and will close on 23.07.2015. Know more information such as AFCAT exam, syllabus, centes, sample paper, notice, eligibility criteria, course pattern etc. are given below. Age: 20-24 years as on 01.06.2016. Qualifications: Graduate (at least 3 year degree course) or 10+2 with math and physics aggregate 60% marks. Physical standards: Minimum height: 162.5 cms with correlated weight, Leg Length: Min - 99 cms. Max - 120 cms. High Length: Max - 64 cms. Sitting Height: Min - 81.5 cms. Max - 96 cms. Age: 20-26 years as on 01.06.2016. (L1) Physics / Engineering Physics (L2) Mathematics / Engineering Mathematics (L3) Engineering Graphics / Engineering Drawing (L4) Electrical Engineering / Electrical Technology (L5) Control Engineering (L6) Microprocessors (L7) Digital Electronics / Basic Electronics (L8) Computer Networks (L9) Information Technology (L10) Network Theory Design (L11) Telecommunication Systems (L12) Electronic Circuit Design (L13) Radar Theory (L14) Switching Theory (L15) Instrumentation (L16) Microwave Engineering (L17) Antenna and Wave Propagation (L18) Electronic Devices. (M1) Physics / Engineering Physics (M2) Engineering Maths / Mathematics (M3) Engineering Drawing / Graphics (M4) Automotive Engineering / Plant Engineering / Industrial Engineering (M5) Engineering Mechanics / Strength of Material (M6) Aerodynamics (M7) Thermodynamics and Applications / Heat Power Engineering (M8) Heat and Mass Transfer (M9) Theory of Machines (Kinematics and Dynamics of Machinery) (M10) Fluid Mechanics / Turbo Machines (M11) Flight Mechanics (M12) Machine Drawing / Machine Design (M13) Mechatronics (M14) Material Science / Metallurgy (M15) Vibrations (M16) Workshop Technology / Manufacturing Technology / Production Engineering (M17) Hydraulics and Pneumatics (M18) Aircraft Structures. Minimum height Men: 157.5 cms with correlated weight. Graduate (at least 3 year degree course) in any discipline with a minimum 60% marks of aggregate OR Post Graduate degree with a minimum 50% marks aggregate. Graduate degree in B.COM with a minimum 50% marks of aggregate OR Post Graduate degree/ICWA/CA/M.Com with a minimum 50% marks aggregate. Post Graduate degree in any discipline with a minimum 50% marks in aggregate. Height and Weight: Minimum Height: - Men - 157.5 Cms with correlated weight. Minimum 60% marks in aggregate. Applicants must have original degree latest by 15 December 2015. Selection procedure: Applicants who apply online will be call for the will be called for air force common admission test (AFCAT) and engineering knowledge test (ekt) to be conducted on 22 February 2015 (Sunday). Ambala, Amritsar, Allahabad, Agra, Ahmedabad, Barnala, Bathinda, Bengaluru, Belgaum, Bidar, Bagdogra, Bareilly, Chandigarh, Chabua, Chennai, Dehradun, Delhi, Darbhanga, Gorakhpur, Gwalior, Guwahati, Halwara, Hashimara, Hyderabad, Imphal, Jalandhar, Jammu, Jorhat, Jaipur, Jamnagar, Jodhpur, Kanpur, Kolkata, Kalaikunda (Kharagpur), Kochi, Leh, Lucknow, Mumbai, Mohanbari, Mysore, Nal (Bikaner), Nagpur, Ojhar (Nasik), Pathankot, Patna, Pune, Port Blair, Salua (Kharagpur), Srinagar, Suratgarh, Sirsa, Saharanpur, Shillong, Silchar, Sulur (Coimbatore), Thane, Tezpur, Thanjavur, Thiruvananthapuram, Vadodara, Varanasi. How to apply: Applicant who meet the AFCAT eligibility criteria then click on “candidate login” in the career website of IAF www.careerairforce.nic.in and follow the instruction. Date of AFCAT & EKT Exam: 13.09.2015 (Sunday).